TOP – In 1990, Phil Fontaine, then Grand Chief of the Assembly of Manitoba Chiefs, and later National Chief of the Assembly of First Nations, became one of the first Aboriginal leaders to speak publicly about the abuses he suffered as a child at residential school. The shattered glass represents the breaking of the silence in the 1980s as survivors from all over Canada began to speak openly about what happened to them at the schools. The broken glass also represents the shattered lives, shattered families and shattered communities that resulted from the government policy of forced assimilation. The drum dancer sounds the beginning of the healing. The circles moving up and out from behind the drum represent the transformation that governments and churches made, from taking initial positions of denial, to acceptance, and finally to acknowledgement and admission, paving the way for an apology. The snow falls and the moon glows from a northern sky. The dove with the olive branch brings an offering of hope for the beginning of reconciliation and the renewal of the relationship between Aboriginal peoples and the rest of Canada. BOTTOM – The ancestor smokes in the sacred lodge. From the west (represented by the button blanket motif) to the east (represented by the sky dome motif), our ceremonies, languages, and traditional knowledge were intact. This section represents the time before residential schools existed. Important ceremonies marking the transition from childhood to adulthood, such as the strawberry fast, were taught and practiced. Harvesting blueberries, learning about medicines and knowledge of plants and animals were passed from one generation to the next. 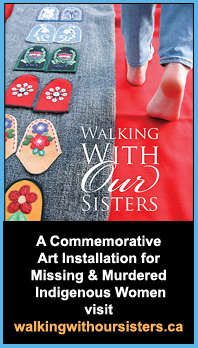 Beadwork and beautiful artwork, reflecting our pride, adorned our clothing and sacred items. The roots represent connection to the earth and to our ancestors. It is expected that, when rendered in glasswork, the colours and white/clear glass circles, or crystals, will give the bottom section an ethereal feel as they will glow from the darkness.